Norris Auto Body Center | May we have your next dents? Norris Auto Body is celebrating 30 years of collision excellence in repairing all make and models. From small dings to major collision damage, we have seen it all. 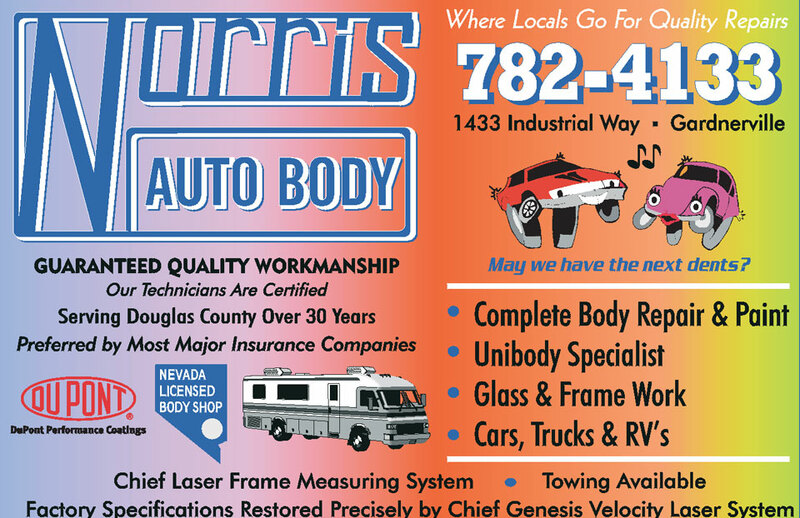 Come check out Carson Valley’s oldest owned collision repair shop. This business was started by Jim Norris after years as the manager of the C.O.D. garage body shop. The oldest Chevy dealership in the United States. The shop is located 1433 Industrial Way in Garnderville, the same location for all 30 years! The shop has 10 bays, state of the art down draft spray booth, Dupont color match camera and auto mix system to ensure the best color match. Furthermore, the body side is equipped with two frame systems which ensures that your care is measured and reset to factory specifications with the Chief laser system.